About one month ago I had a request to write about break-beam sensors. So, here it is! Well, basically break beam sensor consists of two parts: transmitter and receiver. Transmitter emits light (it could be, for example, an LED or a laser) and that light goes to receiver. If that light beam between transmitter and receiver is broken by some obstacle, and receiver detects no incoming light even for a brief moment – it triggers an alarm (or any load you want). For example you can count people that entering some room, or you can use it as an alarm system, yeah, just like in movies! 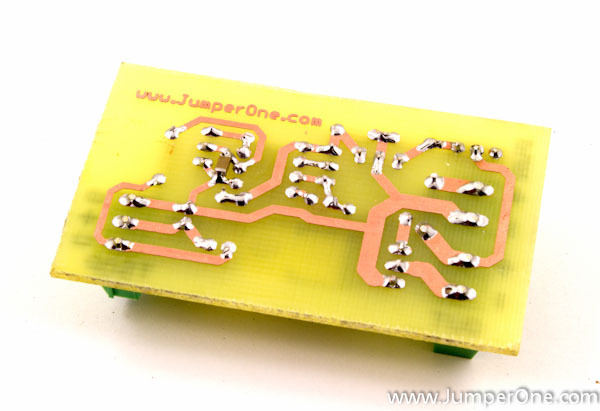 First thing that comes to mind is to connect LED or laser to DC power supply on transmitter side, and use phototransistor with an amplifier on receiver side. But that is not gonna work with changing ambient light level. For example you calibrated your amplifier to work on a cloudy day, and then bright sun shined at it and in this case it won’t trigger an alarm because it already has sufficient level of incoming light. But somehow TV remotes work under any ambient light conditions… It’s because they emit IR light with specific frequency. And TV receivers react only to that specific frequency. It means that it doesn’t care about slowly-changing brightness of ambient light, and reacts only on fast changing brightness level with some specific frequency. The frequency that TV remotes work at is usually 36kHz or 38kHz, but there is many other “standard” frequencies used in IR remote control applications. So, basically infrared LED on a transmitter side should switch on and off with that frequency. 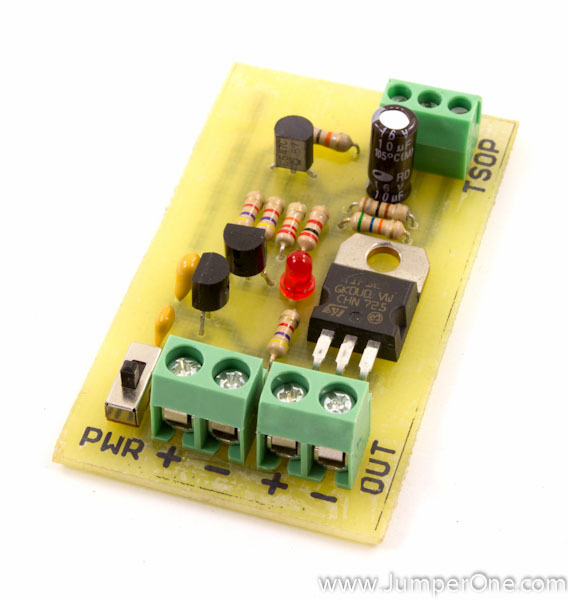 For this purposes you can buy special receivers that react only on specific frequency. The most popular series of that receivers is TSOP which is manufactured by Vishay (www.vishay.com). It’s pretty straight-forward. 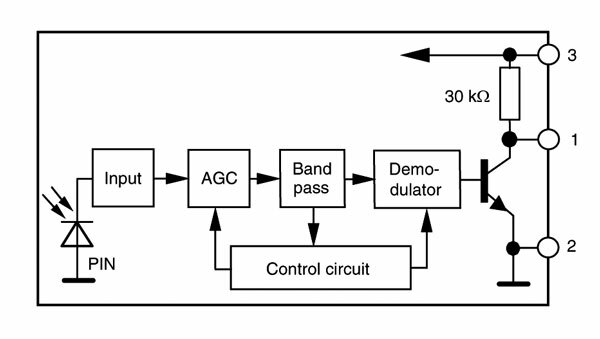 Incoming signal goes to amplifier with controllable gain (AGC) then band-pass filter passes only specific frequency, cutting everything else, and finally it goes to demodulator, which opens output transistor when(and if) it receives signal input after band-pass filter. Well, let’s put it that way: if this receiver detects “blinking” light from IR LED (or IR laser) with specific frequency, it turns on the output transistor. (pin 1 goes LOW). You’ve got IR transmitter on the right and TSOP receiver on the left, which is connected to microcontroller (instead of micro, you can put any low current load to it’s output). 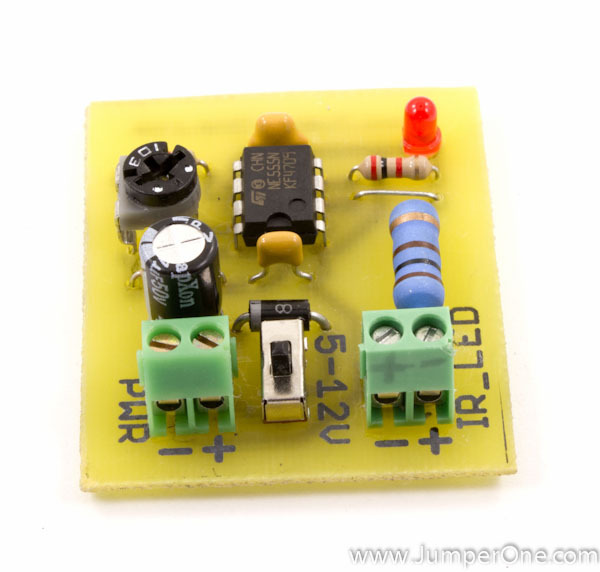 This receiver only needs clean 2.5V to 5V input. So, R1 and C1 is just recommended (but not absolutely necessary input RC filter). R1 is usually 100(ohm sign) and C1 is 4.7uF. TSOP output can sink up to 5mA load current (it can short to ground up to 5mA load). That’s sounds like not much, but hey, this receivers usually used for remote control, and not for working with high current loads. It’s just NE555 timer circuit working in standard astable mode, schematic to which you can find in any 555 timer datasheet as well as formulas to calculate values of resistors and capacitors. Or you can use any on-line 555 timer calculator. Just google for it. As you can see it has two connectors. Power connector, and connector for infrared LED. 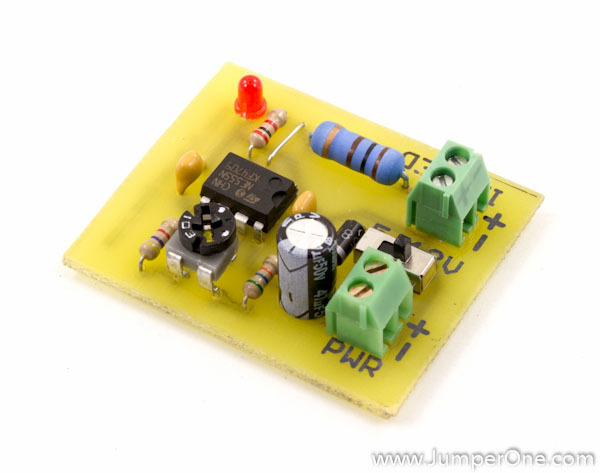 As well as ON-OFF switch and reverse polarity protection diode. 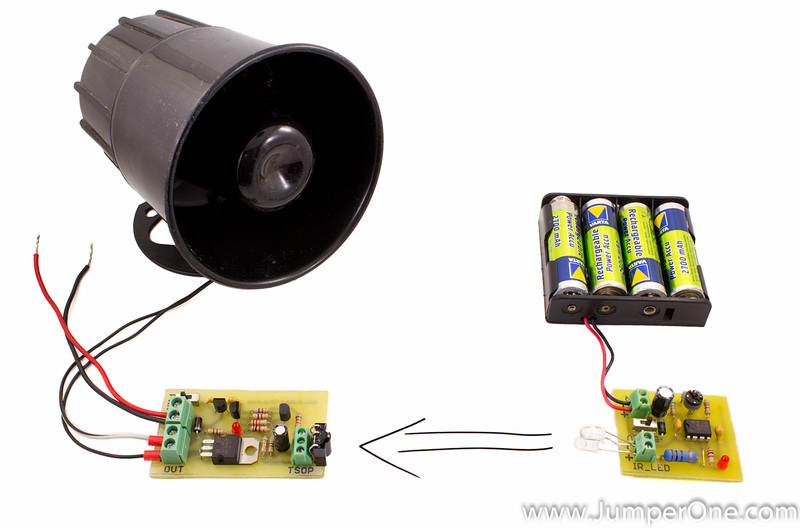 555 timer can drive up to 200mA LEDs, which would be more than enough for about 30+ meters(100+ feet) range. The receiver is a little bit more tricky than transmitter. 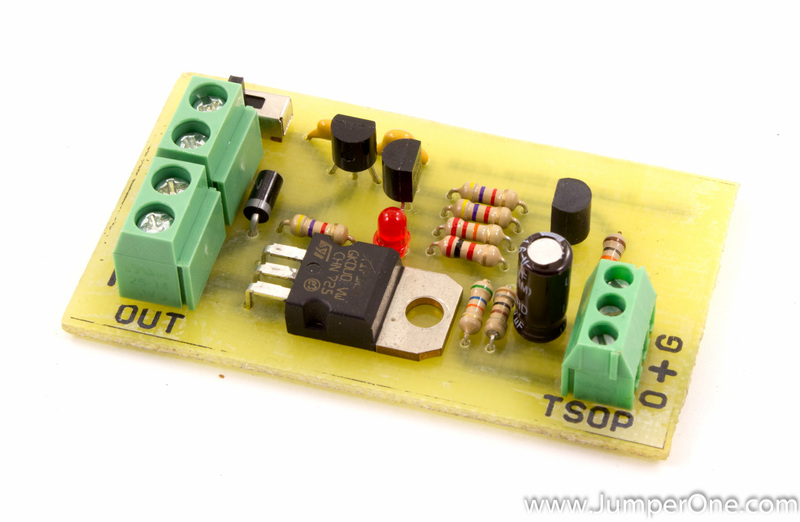 Apart from voltage regulator and TSOP connector it has latch built on two transistors and output darlington transistor. If the beam would be interrupted even for a brief moment, that will trigger the latch and high current output transistor will open, energizing the output. So, you can connect any load to the output and it will be turned on when beam is crossed. Click on schematic to download PDF file. On the top there is 78L05 voltage regulator that provides 5V for TSOP IR receiver. On the left you can see connector for the receiver with some power filtering, which, I think, is unnecessary. 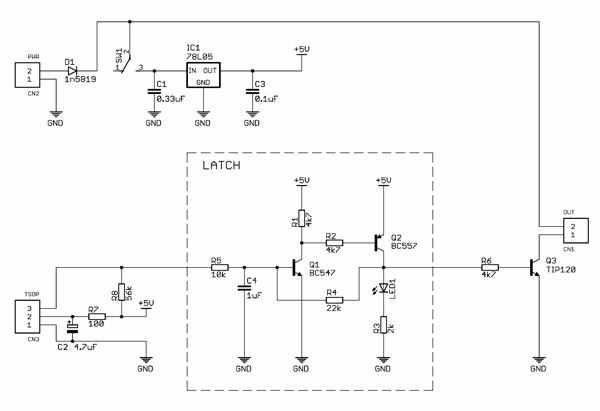 Latch is built upon two low power signal resistors. It’s all is really simple, TSOP opens Q1; Q1 then opens Q2 and then R4 keeps Q1 open making it a closed loop. C4 in the latch section is needed to prevent latch closing on powering on the circuit, when TSOP output is still high. That SMD capacitor on the left (C4) – is my last minute fix.